Margarine is a butter alternative many people reach for when in need of a cooking fat. This spread is a household staple, but not all traditional brands qualify as vegan. 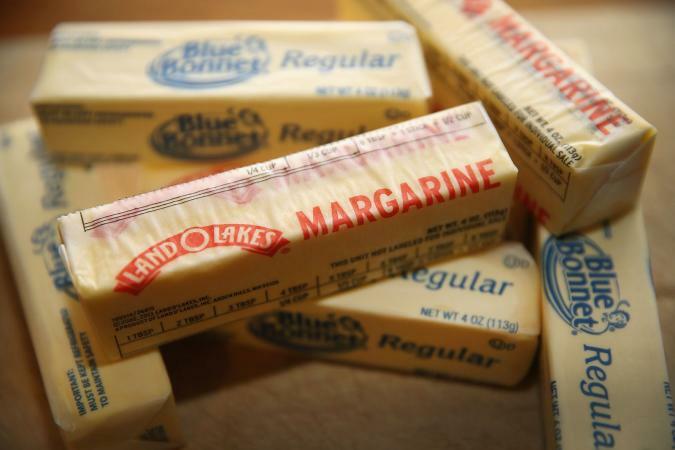 Margarine is a plant-based fat and the main ingredients are typically derived from vegetable oils. Although it is not considered a dairy item, some ingredients in traditional margarine come from animal products. The following are some ingredients found in common margarines that aren't vegan friendly. Buttermilk is found in most traditional margarines. Natural flavors are a common ingredient within margarines. Flora Original spread states their natural flavoring contains milk. Whey can be found in some margarines. Lactose may be added into traditional margarines. Always double check the ingredient label for these hidden ingredients if searching for a vegan margarine. Although margarine may contain animal derived ingredients, there are many vegan margarine products on the market void of any animal-based products. These can typically be purchased at local grocers or health food stores. Earth Balance Natural Buttery Spread Made With Olive Oil: This spread is certified organic, vegan, and non-GMO. This butter-like spread is perfect on toast or for cooking. It can be purchased online or at many local stores using Earth Balance's Store Finder tool. Becel Vegan Margarine: Becel has created as lactose-free, gluten-free, vegan "butter" spread. The main oils making up this spread include canola oils and sunflower oil. I Can't Believe It's Not Butter Vegan: I Can't Believe It's Not Butter is the go-to margarine for many people and luckily, they've created a vegan spread for those who need it. This spread is made from soybean oil and palm oil, and it makes a great alternative to the brand's traditional margarine. Not all margarine is vegan. Traditional margarines may contain non-vegan ingredients such as buttermilk, whey, lactose, or natural flavors. A wide variety of vegan margarine spreads exist to choose from, but always double check the label for non-vegan ingredients.